This weekend, the Duggar clan (including Josh and Anna, Jessa and Ben, and Jill and Derick) gathered in Knoxville, Tennessee, to watch Michael Bates tie the knot with Brandon Keilen. Jana, who is just 11 days older than Michael, was a bridesmaid. Many of the Duggars are still in Knoxville fellowshipping with Gil and Kelly Bates and their 19 kids, as well as with other families who traveled to Tennessee for the wedding. Jill and Derick Dillard, with four-month-old Israel Dillard in tow, flew in from Central America late last week and met up with Michelle Duggar and Jessa and Ben Seewald in New York City to take care of a few business matters. 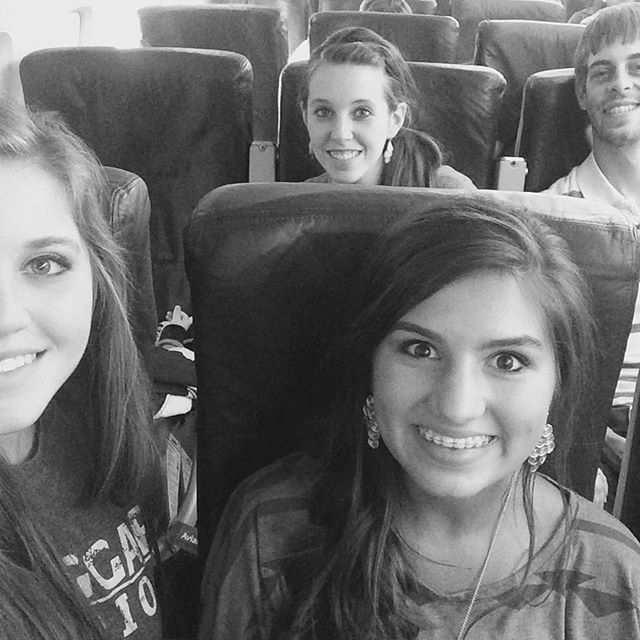 They then made their way to Knoxville, where they met up with the rest of the Duggar family. The Dillards headed back to Central America yesterday afternoon, along with Joy-Anna Duggar and Carlin Bates, both 17 years old. Last month, the Dillards traveled around the region and worked with various mission teams, but during August, they are focusing on learning Spanish. Isn't the name Michaela instead of Michael? To travel up from Central America for just a few days is admirable! I get travel weary driving 2 hours! Hope the girls have a great time! We will continue to pray for all of you through your journey. Where do they get the money to do all of this expensive back and forth flying? I miss the Duggar so much. They definetly had a positive affect on my family. Wish they still had a show where we could all see them again. Josh's behavior is inexcusable,and it sickens me that he would treat Anna in such a manner.Anna blames herself for his sins,and I find that to be totally wrong.Why should she take some of the blame for what HE did? If he continues to behave like this,I say leave him,she doesn't deserve to be humiliated and hurt by his actions. this is a case of punishing everyone for the wrong doing of one. we all know that as much as we would like to think we have control of our kids we know that its not true. at a certain age they will think and do as they wish. everyone is blaming an entire family for what one did. I find this unexcusable. he and he alone made these decisions and he alone should be held responsible. I miss this family so much. TLC has left nothing family friendly on their station. It's a shame they don't care about people. It is sad that what our children do reflects on the parents. This family is human, this is how Christian humans behave. We all should remember to be sure what happens in darkness WILL come to the light. Be sure your sins will find you out. But punish the sin but why make a whole family pay. ?